How is everyone doing? We are snowed in today and probably most of the weekend. We take the phrase “Oh the weather outside is frightful” very seriously here in Wisconsin. Which is fine because we will be having the traditional and magical white Christmas! Speaking of Christmas I am finally sharing my Christmas decorations for a dining room today. 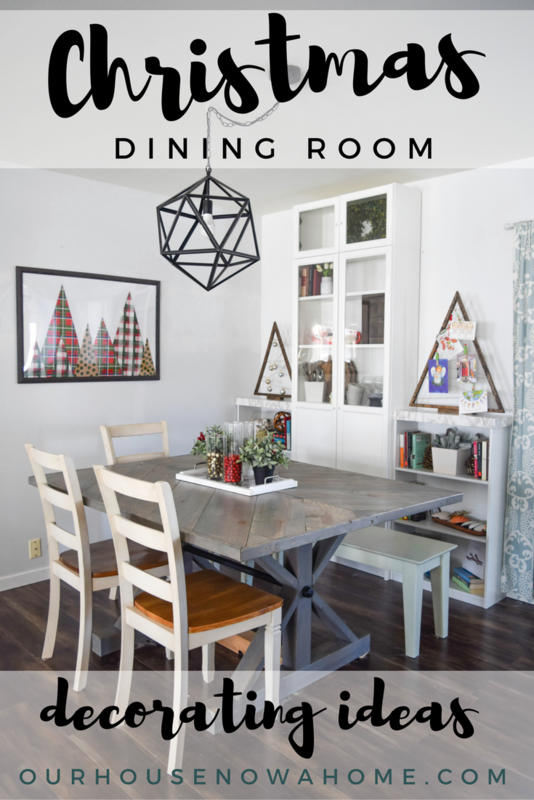 I shared my full Christmas home tour, but my dining room was not done yet. I have been doing some moving around of furniture, including the dining room. I am not ready for the full reveal of it yet. Of course you are getting a massive sneak peek of the new and improved furniture layout, but I am not quite finished. I have some finishing touches to the cabinets as well as some furniture to paint still. I think once the holidays are over I am ready to reveal the new and improved dining room as well as the new family room in the basement. Lots of renovations and DIY in the New Year! 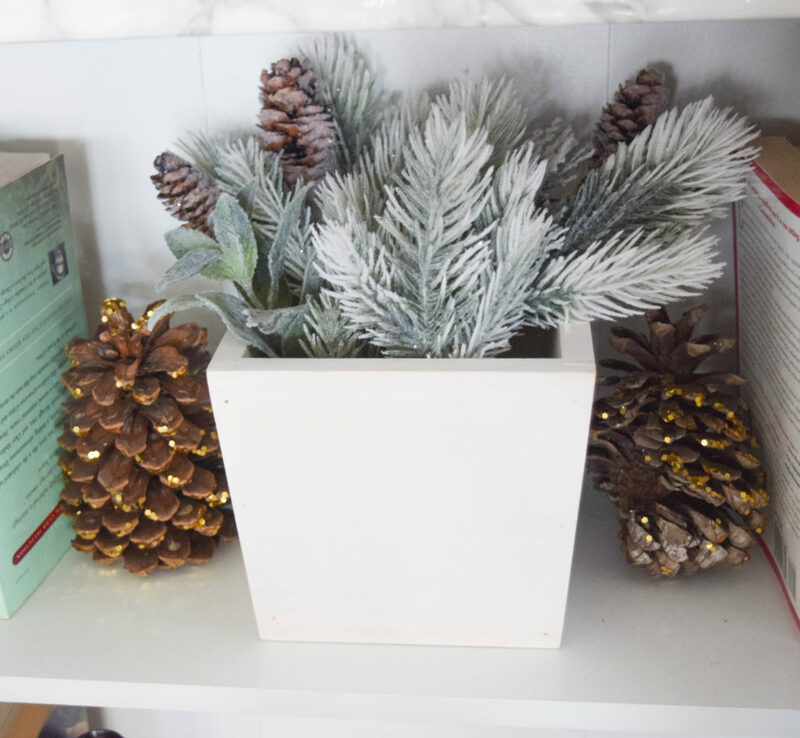 However, I wanted to share the simple ways I added a touch of Christmas cheer to this room, regardless of it being done. 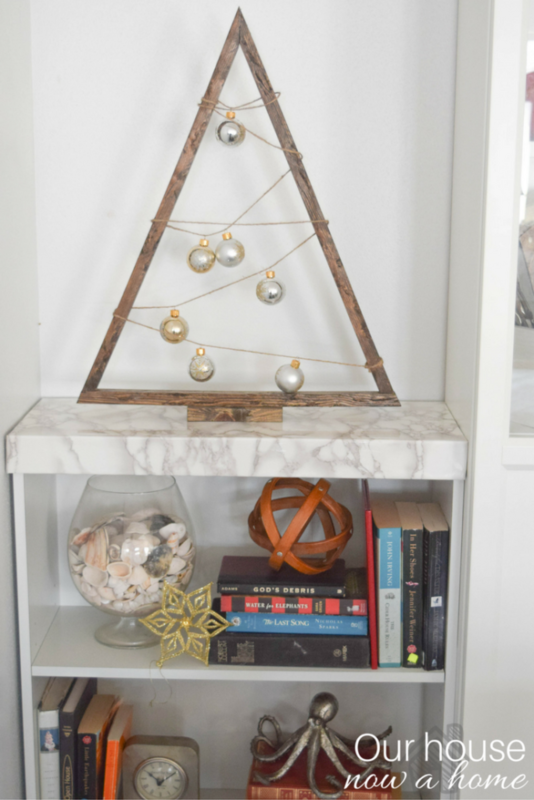 I have one more Christmas project that will be shared next week, for all of you procrastinators or people who are frantically decorating before guests come over. I got you! In the dining room, just like in the kitchen I try and keep decorating to a minimum. Nothing beats function in these rooms, regardless of style. I made these holiday card holders last year and adore the simplicity of them. They also have a modern feel to it with the simple triangle shape. Guys, I adore all of those beautiful tablescapes for the holidays filled to the brim with greenery and other stunning accessories. But, I have small kids, which means anything too tall and either I cannot see them at the dinner table or they cannot see anyone else. I could set it all up and move the centerpiece items anytime we eat, but… no one has time for that… including this Mama. This is a new seating area in my dining room. Now that I moved the table around I have this space, which we actually use a ton. The chairs were redone and the tutorial can be found here. Christmas crafting is a problem of mine, I DO have time for that and probably go a little overboard with ideas. I created these cute paper Christmas trees and they were quick and painless to make! 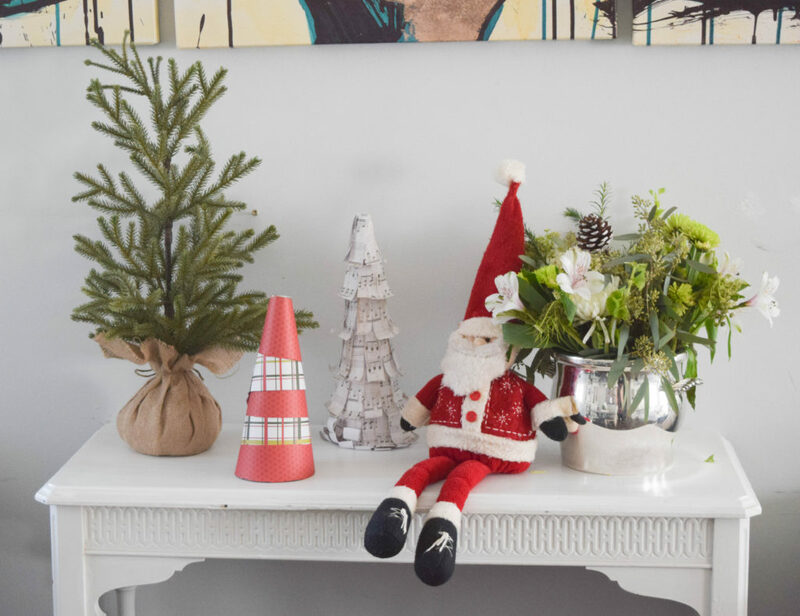 A home with kids, we all need a few Santa’s sitting around. Confession time, we do not do the Elf on the shelf. I think it is such a cute idea, but I know for a fact I will forget to move it a few nights. Parenting fail confession, we have blamed The Tooth Fairy not showing up because it might have rained, and fairies cannot fly in rain, for 3 nights in a row. The Elf on the shelf is too much responsibility for us. Enjoy the Christmas decor, but ignore the new cabinet and shelves. I will be revealing this project soon! I love to actually use to the cute holiday cards we get as decorations. They add such a fun and colorful touch to the home. The view from the table into the living room is so cozy! Each year I think that this is my favorite year of decorating and I will not be as happy with the next year. But then every year I do something different and like it even more. This year is my favorite, and I am sticking to it; until next year. 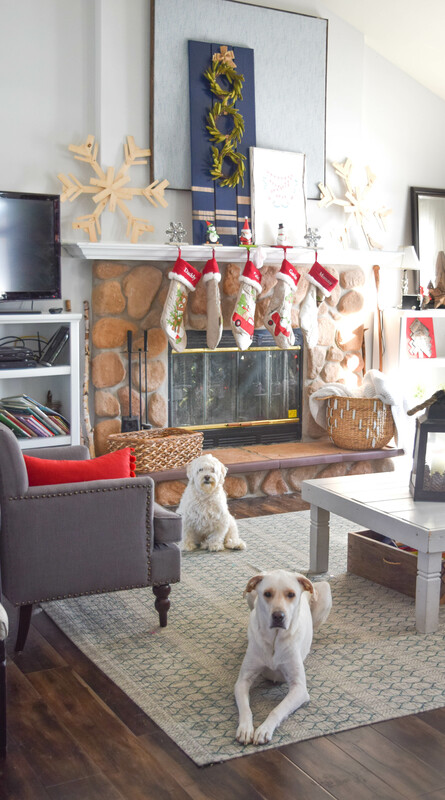 I know this is all about the Christmas decorations for a dining room, but these little photobombs looked too cute not to share. You ever feel like you are being watched? I am, all the time I am at home. They were staring at me the whole time I was walking around the dining room and taking pictures. Our Christmas cards are made and sent out, and then Teddy and Finn pose like this in front of my fireplace?!!! Where was this pose before I sent the cards out?! As you can see, I keep it simple in here. 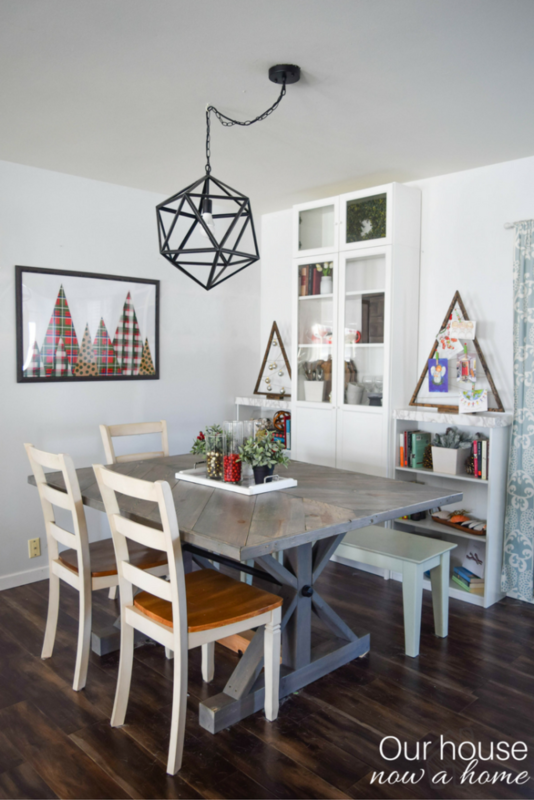 I added a few Christmas trees, new wall art (which is what I will be sharing next week), I show off my holiday cards, and voila, a simple and low maintenance dining room! I know this time of year is always hectic, and any extra time is either spent with family or wrapping gifts. So my Christmas decorations for a dining room are just what I need to get my home 100% done for the season and ready to be enjoyed by friends and family! How is the season treating you? Are you done decorating your home for Christmas? 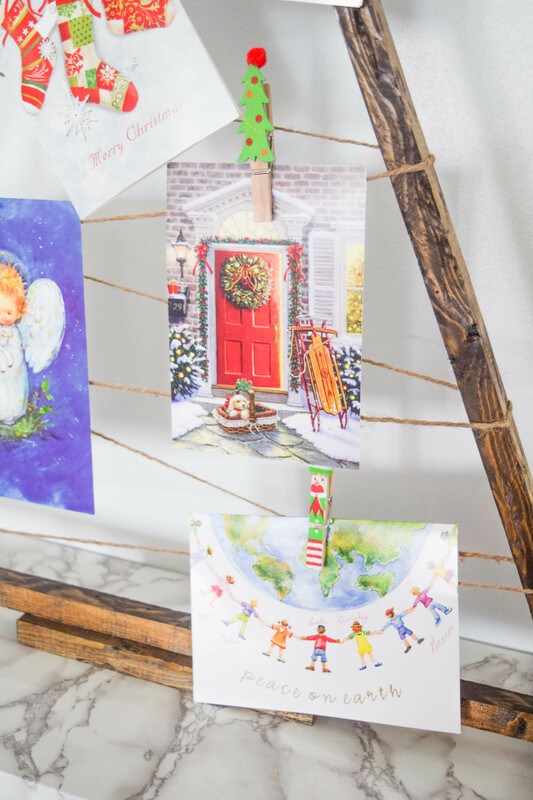 I love the way you use the holiday cards as part of your Christmas decor. Simplicity is so pretty to me and your dining decor is stunning. I love all of these decorations. They’re the perfect combination of modern and classic. I think they’d go perfectly in my home. 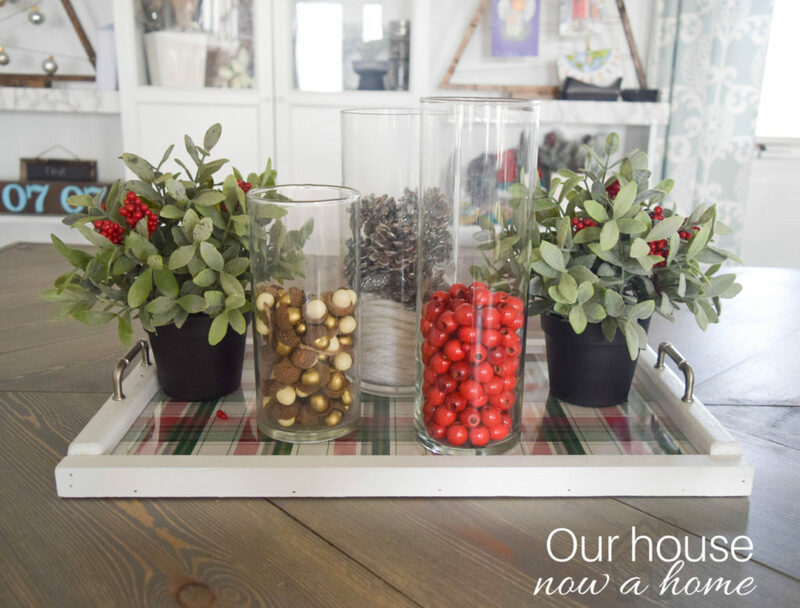 Your home is so festive! We’re actually super late decorating this year because we were traveling up until yesterday. I’ve gotta get on it but you’re giving me major holiday inspo! 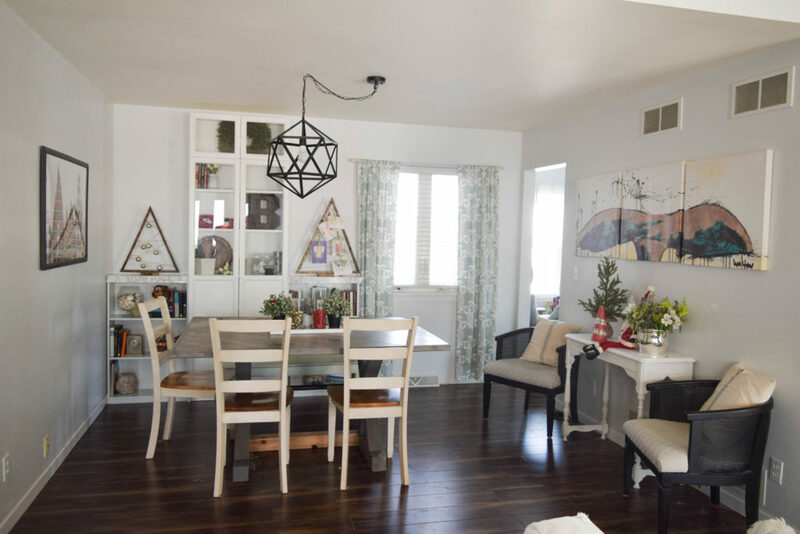 I really love the way you decorated your dining room. That christmas tree with hanging cards looks so adorable. I love the way it came out! I love the Christmas Card tree. It’s so pretty. I must get one. I had a moment of clarity when you said you weren’t responsible enough for elf on the shelf – I’m right there with you! Also, as a mum of 3 little kids, I love seeing other homes that do not have a rug under the dining table. 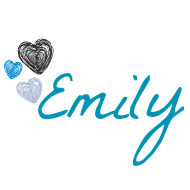 Thanks for the beautiful post! ? Your home is beautiful! This is my daughter’s very first Christmas so we are trying to be very festive with lights and decorations (baby proof of course). We have started doing Elf on the Shelf with my granddaughter. The elf stays down at my house so I can move it if she is coming over. I love your tooth fairy excuse. I am in love with your style! You pull Christmas off so well while keeping it subtle and classy. I love your card display! I need to do something like that for mine. The card display is so cute and such a great idea, I am going to have to make one for next year! Thanks for sharing!! 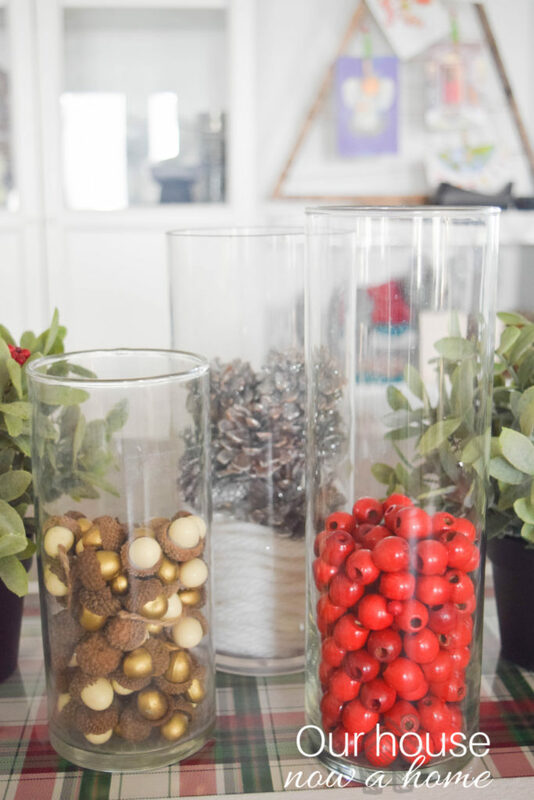 My two faves: The acorns in the glass and the musical note paper christmas tree super cute ideas – I agree, if the centerpieces are too tall, I can’t see my husband or my kids! How super cute is your santa. Love him sitting there on your table. Everything looks so beautiful. You did a great job decorating. Love the style. I love your Christmas tree card holder. Perfect for my favorites! 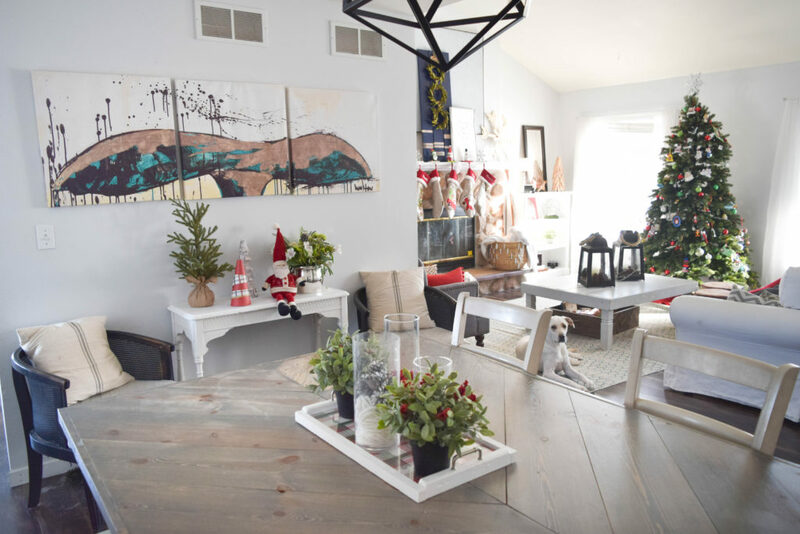 These are all great Christmas decorations for a dining room. I love the triangle card holder and the one with the balls on it. The paper trees and the little real tree are awesome too. Thanks for sharing your dining room and the fireplace area which is gorgeous. What a gorgeous home! I just love these ideas. They are just so simple, yet add such a festive touch to everything! Great ideas! 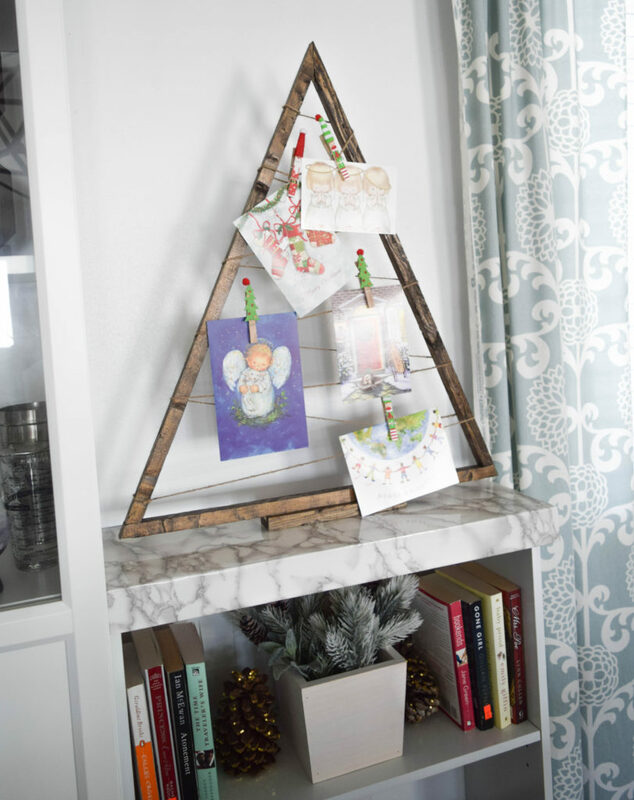 The Christmas tree of greeting cards is a great way of displaying them. 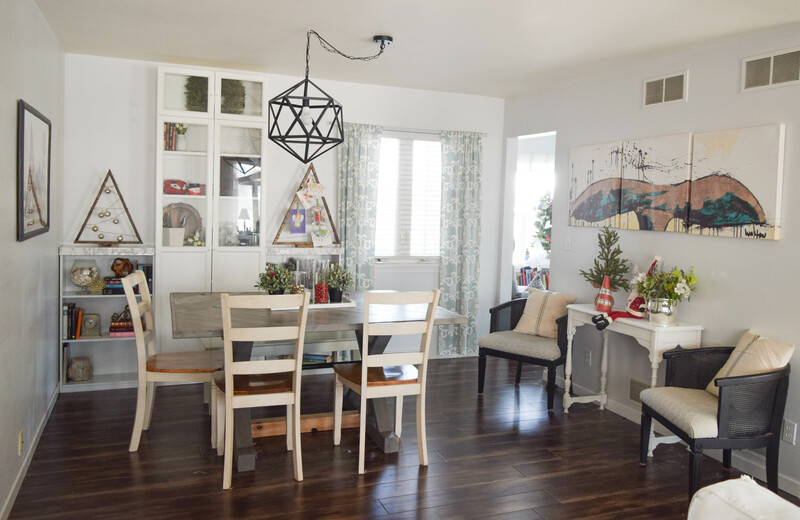 I love all of the Christmas touches in your dining room! It’s just perfect!! Your home looks so beautiful. I love the christmas tree with the cards. Really great decorating ideas. I love the wood tree for the cards and the giant snowflakes. It looks like you had a lot of fun. I love your decorations! Just like Emma, I love the Christmas tree with those cards as well. I love that Christmas card holder and your dining table. Merry Christmas to you and your family! 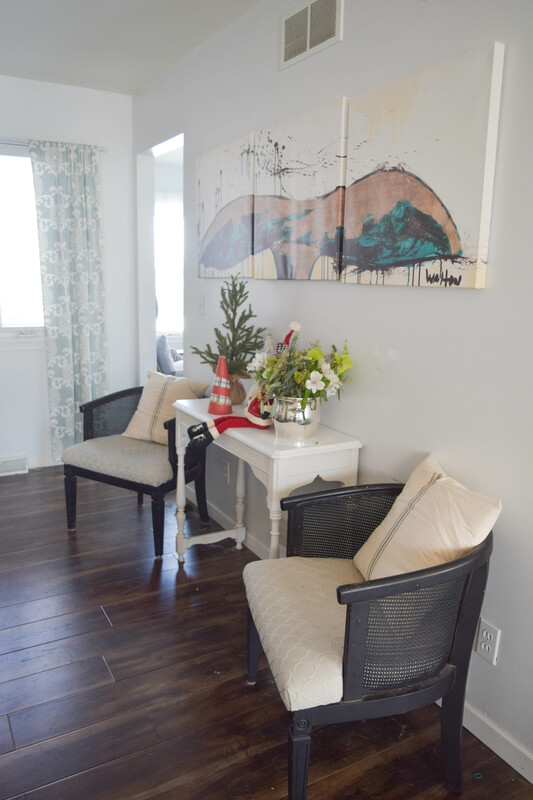 Your home always looks lovely and clean! You have great taste and are very talented. Every time I see your pictures they remind me from something out of a magazine! Merry Christmas to you and your lovely family! I love those Christmas tree card/ornament holders!! So simple, pretty, and functional! 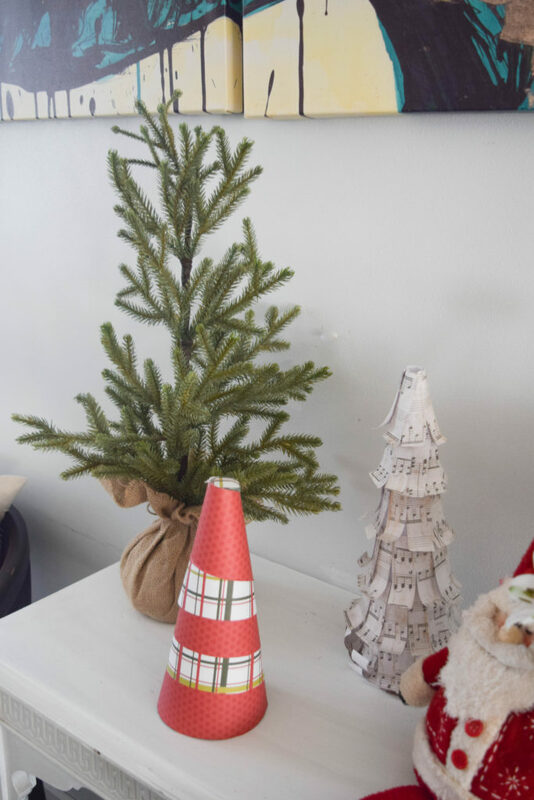 I love all the non-traditional Christmas trees in your dining room. What a beautiful space.